My Vision is Fine – Why Do I Need An Eye Test? Our vision is one of the most valued of our five senses. Although it’s a cliché, it’s something that many people do not fully appreciate until they begin to have problems. However, regular eye examinations can help prevent the development of serious vision problems. Just as you take care of your body by eating well and exercising, your eyes deserve to be looked after properly too. Whether you feel you have perfect vision or think your eyesight may be deteriorating, it’s important to get your eyes tested regularly because it is not simply a question of how well you can see. Many eye problems develop very gradually, over a period of several years, so symptoms may not be apparent immediately. You may not even be aware that there’s a problem. However, regular eye examinations will pick up on any changes in your sight. Regular eye tests mean that any possible vision deterioration is more likely to be noticed at an early stage, so that corrective action can be taken sooner. With many eye conditions, the earlier they are spotted then the easier it may be to slow or prevent further deterioration. As well as monitoring the health of your eyes, an eye examination by a qualified optometrist can also potentially detect life-threatening health conditions, through warning signals picked up within the eye itself. High cholesterol can cause a white ring to appear around the cornea, the clear part of the front of the eye. It can also cause blockages in the blood vessels on the retina which can lead to loss of vision and is a risk factor for coronary heart disease, stroke or heart attack if left undetected and untreated. The high blood sugar levels associated with diabetes can damage the retina, leading to diabetic macular oedema, where the centre of the retina (the macula) can become swollen by blood vessels leaking fluid into it. These symptoms can be detected in an eye test and most diabetes-related blindness can be prevented. Bleeding within the eye could be a sign of other conditions, including high blood pressure. Should your optometrist see any of these warning signs as part of your eye test, it is likely that they will refer you to your GP for further treatment. Therefore, it is vital that you have your eyes checked regularly to help prevent other health conditions remaining undiagnosed. 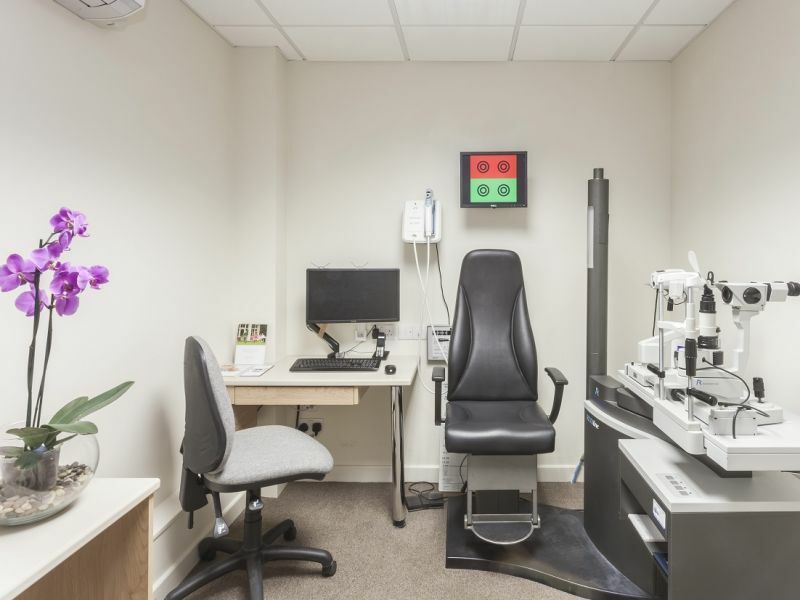 Here at Leightons, we’ve invested in the latest technology to monitor your eye health as closely as possible and deliver the best possible level of care. OCT (Optical Coherence Tomography) scanning is available in our branches as part of the Leightons Ultimate Eye Examination. Completely painless and non-invasive, OCT is effectively an ‘ultrasound for the eye’. It gives a 3D scan of the layers of your retina at the back of the eye, and can detect any abnormalities such as early signs of macular degeneration or glaucoma up to five years before traditional eye tests. Leightons also has Optomap™ technology in six branches, which can take a detailed image of more than 80% of the retina. The traditional method of looking through the pupil of the eye allows the optometrist to see only 10-15% of the retina. Optomap is available as part of the Leightons Advanced Eye Examination. Leightons Opticians and Hearing Care provides a comprehensive eye examination to help monitor not only your vision and the health of your eyes, but the health of your body. In addition to advanced screening techniques such as OCT and Optomap, Leightons branches also offer a standard NHS sight test. You can see whether you qualify for a free NHS eye test here. Use our branch finder to find your nearest branch. You can book an appointment online or call 0800 40 20 20.